Sand dunes sound so friendly and relaxing, don’t they? The words ‘sand’ and ‘dune’ may even bring thoughts of beach chairs, sand castles and cheap plastic rafts to some. To be completely honest, I didn’t have that exact beach-chairs-sand-castles-plastic-rafts view of sand dunes before going to visit the Sleeping Bear Dunes National Lakeshore in Michigan, but I also wasn’t quite sure just how formidable the dunes would be. 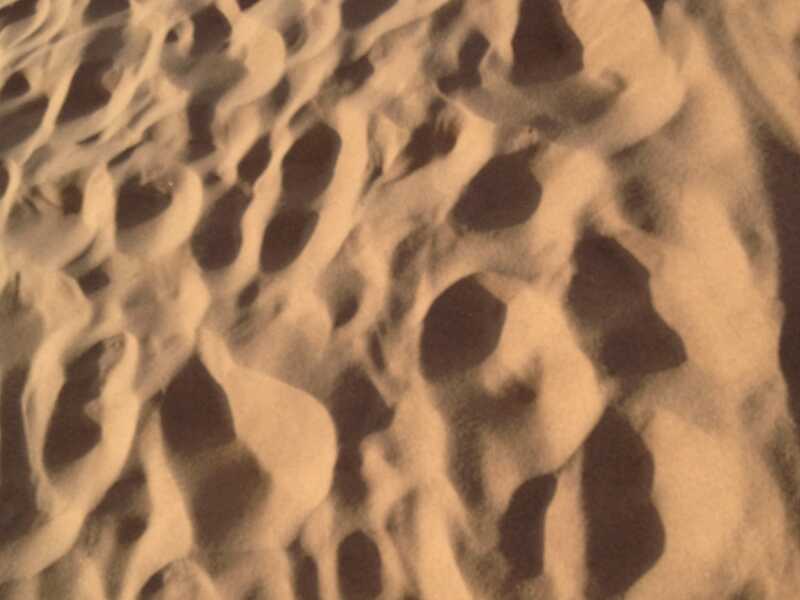 I had been told by friends who had been to these dunes that the dunes were indeed formidable and I knew for a fact that the region in which these dunes lie offers up one of the most important elements for the existence of dunes: wind, lots of wind, lots of strong wind. But, as with many other things, I had to see it for myself and I wanted to experience it for myself. 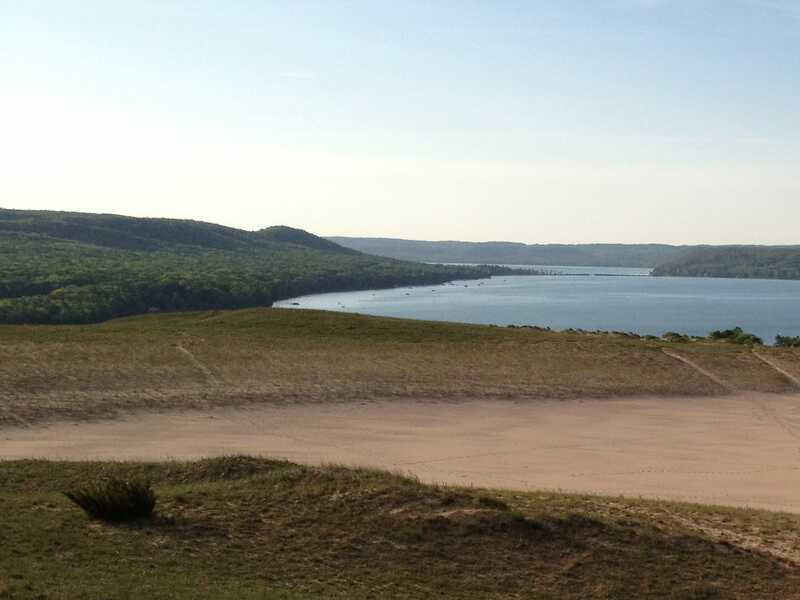 Sleeping Bear Dunes National Lakeshore includes a 35-mile stretch of Lake Michigan’s eastern coastline in northern Michigan. 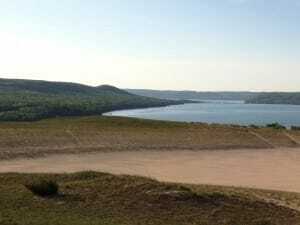 Two islands – North Manitou Island and South Manitou Island – are part of the Sleeping Bear Dunes, as well. I was not able to visit those islands this time around, but I was able to sneak many views of the pair. Climbing the initial dune and hiking the subsequent Dune Trail together make up a strenuous 3.5-mile roundtrip from. The 3.5-mile route travels from the bottom of the large initial (formidable) dune all the way to the Lake Michigan shoreline and back. In order to complete the approximate 1.75-mile one-way trip, one must scale a minimum of six or seven serious dunes. The Dune Trail itself is well-marked and easy to follow. Even so, Lake Michigan repeatedly pops out at the top of dunes, so ensuring that you’re on the correct path is easy to do. The trail opens up to tremendous views along the way – each view getting better as Lake Michigan gets near. The sun can be relentless on the dunes when the skies are clear and shade can be tough to come by. We enjoyed frequent breaks atop the series of dunes, most of which came with excellent views of the northeastern shore of Lake Michigan. Most hikers I encountered wore shoes on the dunes, but I preferred going barefoot for the majority of the journey. Bugs and prickly dune plant life do pose minor dangers but the feel of sand with each step made the journey a much more enjoyable one for me. Speaking of enjoyment, I enjoyed the Dune Climb and hike of the Dune Trail so much, I went back for more. I set the alarm for 4:30 am the next day to go back for a quick solo jaunt when the sand was cold and the sun just rising. Tip : Don’t forget your pack. Bring water and food on this hike, it can take up to 4 hours to complete and can get very hot in the summer months. 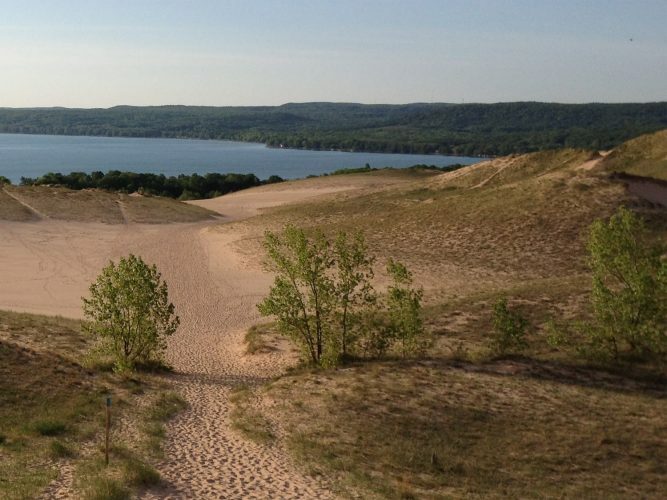 Tip : The Pierce Stocking Scenic Drive is right around the corner from the Dune Climb. If you decide to check out the views on this 7-mile drive, be sure not to miss the Lake Michigan Overlook (#9, #10). The views here are beyond tremendous as you look out onto Lake Michigan from a massive observation deck nearly 500 feet above the shoreline. Sit atop the massive dune to the south of the observation deck for an even better experience. The town of Empire, MI is located about 25 miles west of Traverse City, MI. 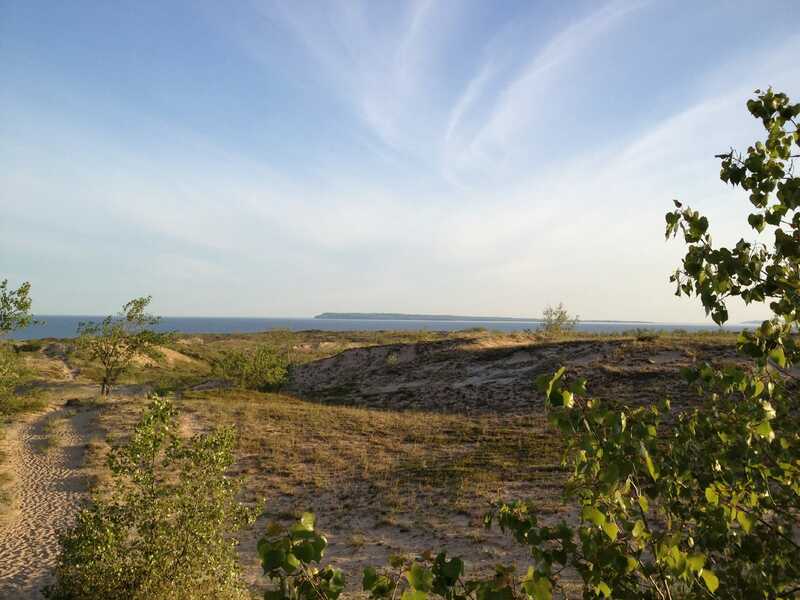 The Dune Climb is located 5 miles north of Empire. Travel west on M-72 to reach Empire. The visitor’s center is there, too. From Empire, head north on M-22 and then M-109. The large initial dune will be visible on the west side of M-109.